• These are Sony xplod 6"inch Speakers located in the back rear nest to the window under the panel. They match the brand of the head unit also.• 29/07/11, today i took my car into Eastland HIFI electricals so that they could wire up my new headunit. Better to do it professionaly than try figure it out yourself. so here is the end result.From this. Windows. • I have come across a problem with the electric windows, an am very disipointed in whats happened, the electric windows will not work as they have either been seized, or the water has got to them. thankyou TX3. • This is where the TX3 i picked up comes in handy, as i could not find any garage that were able to find the part i was looking for i decided to switch the electric windows with manual. will now be able to bowz with the windows down.• Final result, is that i switched over the manual windows, heres a pic. • So i acquired the Sony Xplod CDX-DT180 complete headunit. Anti-Shock, PLAYABILITY - 100dB & compact disc digital audio text. SOUND - LPF/HPF, EQ3 stage 2. EXPANDABILITY - Front Aux, Sub Out. 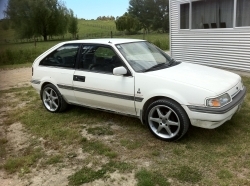 Exhaust.• So i viewed a few profiles on here, and i noticed that one guy cut the exhaust on his 88' ford LASER. So it influenced me to do the same. From this. • Now i can cruise with music, and layback. thanks HIFI.Mags/Tyres • 13/11/2011, today i bought a rolling body TX3 Ford Laser Hatchback, motor had been stripped interior had been stripped, but was not interested in any of that stuff at the time.the car came with some racing wheels and 17' mags, atm they are dirty and are in need of a tune up, my project laser is currently sitting on 12' stock wheels. here are some images. Wheels/Mags.• So i started to jack up my car and apply the new mags onto it, i got the front right hand wheel on, it was clearing the suspension by about 5mm, that was algood, then i jacked up the back and put the rear wheel on, this is where me and my dad came upon a problem. The suspension was sitting hard down on the tyre surface and there was nothing possible to do at the time. 19/11/2011, we took the tyres into Firestone were we got a quote on what we should do, the guy tells us that the tyre height is too high, and needs to change the tyre diff to a 205/40/17" tyre for the suspension not to drag on the tyre. so thats what we done, we bought all new tyres and got them to fit it. now it looks a little somthing like this.